Although my specialties are close-up intimate portraits of animals and iconic landscapes, when you are out shooting and a beautiful wild animal happens by, you can’t help capturing them (photographically speaking) in their natural environment. On the trip to British Columbia mentioned a few posts ago, I had seen a brochure for a “bear tour” offered at the extreme sports desk in downtown Whistler. Run by a bear “expert,” a few of us adventurous (ie. crazy) souls hopped into this man’s SUV for a summer drive up the ski slopes and into the woods. 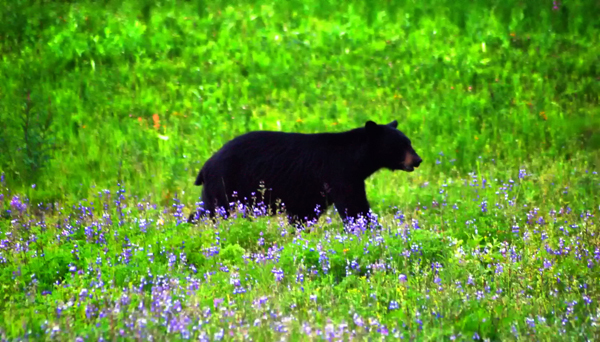 There he brought us (on foot) to within a very short distance of some 300 to 400 pound Black Bears in the wild. Apparently (and gratefully) they were used to his presence, because they went about their business as we quietly stood by in awe. The darkness of the woods made it very difficult to get a good shot (I didn’t think using a flash was wise), so I was lucky to capture this one image as the bear left the woods and crossed a field of flowers. This is one of several bucket-list items I have tried once, I cherish the memory of, but don’t plan on doing again…at least not for this species. 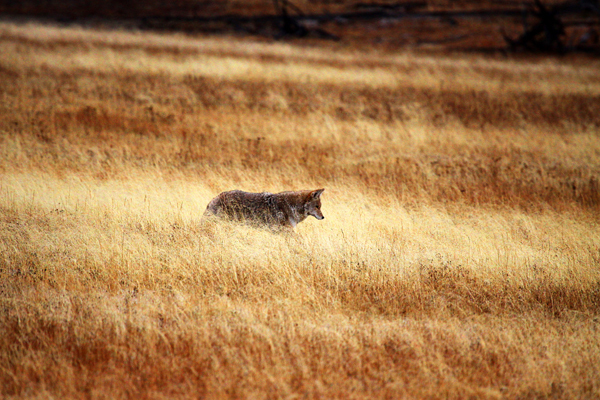 Driving along the road seeking landscape images in Yellowstone, I came across this wolf making his way across a field. Reminded of the bear image I captured many years before, I shot this as he passed in front of me. The image tends to show my progression as a photographer and in this National Park the wildlife is accustomed to humans, which can be very dangerous when we get too close to them… Thank goodness for long lenses.